Whether you are booking a holiday, getting a quote, requesting that your details are added to our offers mailing list, or joining our email offers list, we may ask for your name, telephone number and e-mail address. If you are booking your holiday online, we'll also need your credit/debit card details (including card number, cardholder name, expiry date and start date for Mastercard) in order to take payment and confirm the booking on-line. Please note all credit card payments are subject to a 2% charge. HOW DOES AFRICA AWAITS TOURS AND SAFARIS USE THIS PERSONAL INFORMATION? We need your name, address and/or e-mail address so that we can send out information, and/or advise you of special offers/promotions we think you may be interested in. On all forms you will be given the opportunity to opt-out of receiving occasional marketing information from Africa Awaits Tours and Safaris. If your email or address details have changed or you no longer require marketing information please send your existing and new contact deatails to us. We need your name so we can confirm for whom the booking was made to the relevant hotels, airlines etc. We may also use this information to let you know about any special offers/promotions we think may be of interest to you. We may also use your IP (Internet Protocol) address to diagnose problems with our server and administer the web site - monitoring visitor traffic patterns and web site usage to help us develop and improve the Africa Awaits Tours and Safaris web site further. Information you supply to us will be passed to our suppliers (such as airlines, hotels, transport companies) and agents only where necessary for the purposes of booking your holiday. HOW DOES AFRICA AWAITS TOURS AND SAFARIS PROTECT CUSTOMER INFORMATION? Yes. These cookies are only used to recognise repeat visitors and to facilitate the brochure request process. Cookies used can not be used to trace visitor behaviour across other websites. (A cookie is a small piece of information sent by a web server to store on a web browser so it can later be read back from that browser. This is useful for having the browser remember some specific information (ref. Cookie Central)). 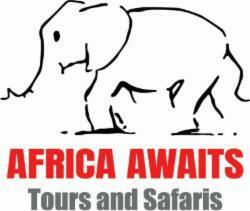 WILL AFRICA AWAITS TOURS AND SAFARIS DISCLOSE ANY OF THIS PERSONAL INFORMATION TO THIRD PARTIES? Africa Awaits Tours and Safaris will only disclose your name and booking details to our suppliers for operational purposes. We will not pass on your details to other companies for marketing purposes. WILL AFRICA AWAITS TOURS AND SAFARIS USE THE INFORMATION I GIVE FOR DIRECT MAILINGS?